(d) Determine the numerical value of the volume (V2) of the gas at the end of the isothermal expansion mentioned in process (ii). (a) The required P-V diagram is shown in the adjoining figure. 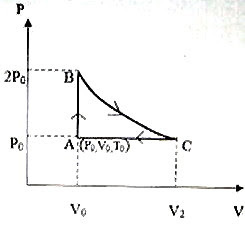 (b) As shown in the P-V diagram, the pressure and the volume of the gas are finally rstored to the initial values P0 and V0 respectively. Since PV/T is a constant for a given mass of ideal gas, the temperature of the gas must be equal to the initial temperature T0. (c) In process (i) the volume is constant. The work done is the integral of PdV where dV is the change in volume at pressure P. Since there is no change in volume, no work is done in process (i). [To explain this in more fundamental terms, the point of application of force does not move when the volume is constant and hence no work is done]. (d) We have PV = nRT where P is the pressure, V is the volume, R is the universal gas constant, T is the absolute (Kelvin) temperature and n is the number of moles of the gas. V2 = 1×RT/P0 where T is the temperature at which the isothermal expansion occurs. From state A (P0, V0, T0) as shown in the P-V diagram the gas changes to state B (2P0,V0,T). Therefore, P0V0 /T0 = 2P0V0 /T from which T = 2T0. V2 = 1×RT/P0 = R×2T0 /P0 = (8.31×2×273)/(1.0×105) = 0.045 m2, nearly. You may get simpler questions with variations. For instance, a P-V diagram similar to the one you have drawn may be given in the question itself and you may be asked to state whether heat energy is added to the gas or removed from the gas during the process indicated by curve AB. Indeed heat is added since the pressure is increased at constant volume and this can happen only if the temperature of the gas is increased. You may be required to calculate the heat absorbed by the gas during the process AB. 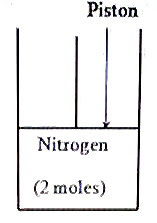 The heat absorbed is nCv(T –T0) where n is the number of moles of the gas (n = 1 in the above question), Cv is the molar specific heat at constant volume and T is the temperature of the gas in state B. You can calculate T using 2P0V0/T = P0V0/T0. The value of Cv may be given in the question, but even if it is not given you should know the value for a mono atomic gas to be (3/2)R where R is the universal gas constant. (iv) With the cylinder still in contact with the boiling water bath, the pulling force of 60 N on the piston is now withdrawn and the gas is allowed to get compressed to state D.
(a) The pressure of the gas is initially equal to the atmospheric pressure P0 = 1.0×105 Nm–2. V1 = 2×RT/P0 = (2×8.31×300)/(1.0×105) = 0.05m2, nearly. (b) The process from state A to state B is isothermal since the temperature remains constant through out. The pressure of the gas changes and hence it is not isobaric. The cylinder is in not thermally insulated from the surroundings and there is enough time for the temperature of the gas to attain the value of 27º C through out the process since the full force is not applied abruptly. (c) In state C, the pressure of the gas is the difference between the atmospheric pressure and the opposing pressure (force per unit area) produced by the pulling force. Therefore, pressure = 1.0×105 – [60/(1.5×10–2)] = 0.96×105 Nm–2. (e) The change from state D to state E is through an isobaric process and the work done (by the gas) is PdV = PAdx = (1.0×105)×(1.5×10–2) ×0.1 = 150 J.